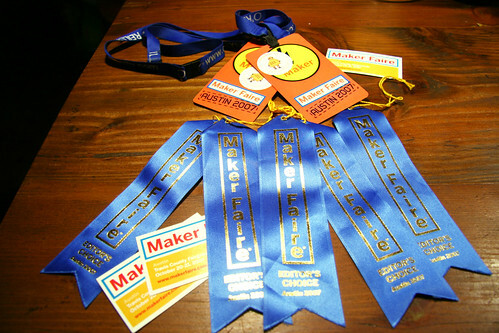 Maker Faire Austin- a sucess with 5 blue ribbons! We heave returned at last from that great state of Texas and come back from Maker Faire with 5 - that's right ... count em'... 5 blue ribbons for our Art Golf, mini-golf course! We heave returned at last from that great state of Texas and come back from Maker Faire with 5 - that's right ... count em'... 5 blue ribbons for our Art Golf mini-golf course! 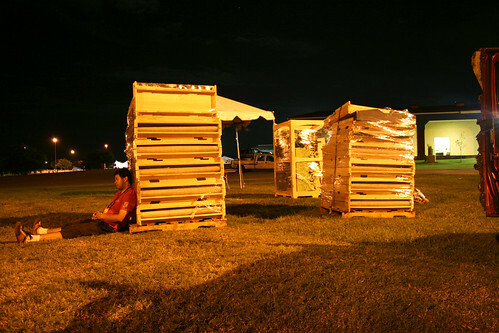 We had tested and played parts of the course, but had not put the whole thing together until we arrived in Austin. And it all worked great! The big and little kids at the faire loved the course so much, we saw the same people over and over again throughout both days- coming back for more. The whole course took a few hours to put together from it's packed up state, and took even less time to break back down and pack up again. Because we made the course to do so, the "clam shell" play fields clip together and come apart with incredible ease. 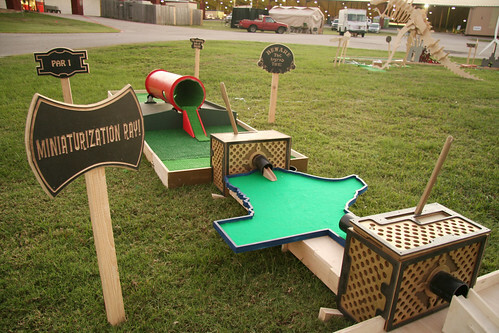 The "props" for the course either lay on top of the play fields with no assembly, or they clip into the existing system like the play fields themselves. This system for the course enables us to make more tracks and obstacles in the future that can just clip into the existing tracks. 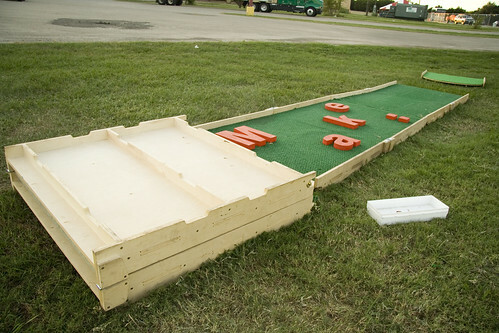 What we want to see happen is a full art / mini-golf "show" where we make more of these tracks and hand them off to other artists, designers and geeks, and have each make their own "hole", then get back together for a full mini golf course and Art Show. It would be interactively- awesome! 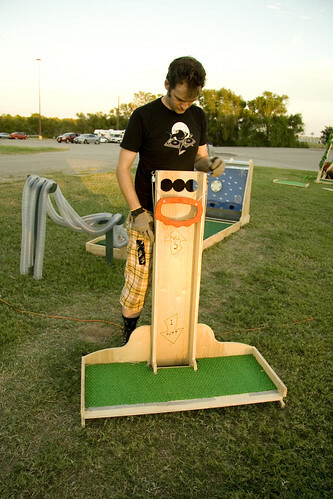 We are going to work on making that happen next year- so keep an eye on www.artgolf.org for future updates. And because the whole thing folds up for shipping so well, it could move around from venue to venue, growing and changing! The current course of 9 tracks, and 9 "props" and obstacles folds up into 3 stacks about 6ft tall and 4ft wide. 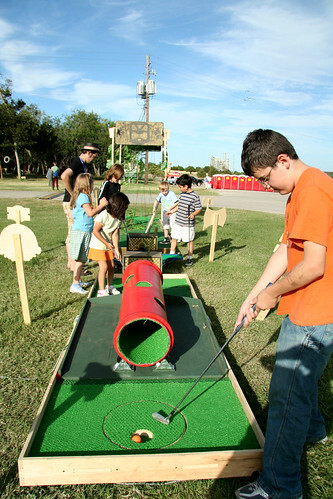 Feel free to contact us with any questions about ArtGolf for your next party! Maker Faire Austin was Awesome!